This quick, 7-ingredient grilled shrimp dinner is summer in through-and-through. Served with a grilled peach pico, this simple dinner is anything but simple in flavor. When I hear “7-ingredient recipe” I think easy to make and quick to the table. But rarely do I expect these types of recipes to be satisfying and flavorful. My goal was to create a recipe that had all the benefits of a short ingredient list while still maintaining dimensional flavor and creativity. This grilled shrimp recipe delivers in a big way. It’s easy to make and throw together any night of the week but tastes like you spent hours perfecting it. Smoky grilled shrimp pairs perfectly with a sweet and spicy Grilled Peach Pico, offering a little bit of everything. If you are willing to spring for one more ingredient, the Grilled Peach Pico really benefits from fresh cilantro, toss in 2-3 chopped tablespoons for an extra bit of freshness. It’s great on any fish, but especially delicious on top of fish tacos. 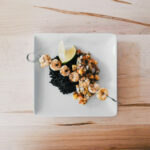 Make this a bigger meal by serving the grilled shrimp and peach pico with citrusy black rice or black lentils. Wondering why I am talking about 7-ingredient recipes so much? Skewer 4–5 shrimp on four metal skewers, brush with 3 teaspoons olive oil and sprinkle with ¾ teaspoon lime zest, season with salt and pepper. Brush peach halves and onion pieces with 1 teaspoon olive oil. Place peaches and onions, cut side down, on grill. Grill peaches until charred, 10 minutes, flipping halfway through. Grill onions until charred, 13–15 minutes, flipping halfway through. Transfer peaches and onions to cutting board; dice when cool enough to handle. Grill shrimp until opaque, 2 minutes each side. Transfer shrimp to a plate. In a medium bowl combine diced peaches, onions, tomatoes, jalapeño, 1 tablespoon lime juice, ½ teaspoon minced lime zest and chopped cilantro (if using). Season with salt and pepper. Serve grilled shrimp with peach pico, cooked black rice, and diced avocado (if using). I like to add the zest and juice of one lime to cooked black rice to bring this whole meal together. Although the meal doesn’t need it, it’s a great way to bulk it up if you’re really hungry.